After taking a small break from ants, I decided I wanted to come back with a bang. 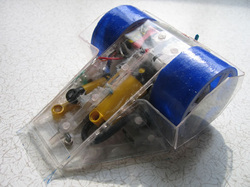 Still dissalusioned with servo flippers, I started turning my mind to pneumatics, to get me the big flip I wanted. I had considered running a 100psi system with a massive ram, but I soon realised it would be very, very difficult to fit enough air storage into Void's small body to allow for many powerful flips. This is when my mind started thinking about a compressor, and although I was skeptical if I could get it to work or not at first, it turned out pretty well. It was basically a speed & rotation modified Naro HP/BB+ through some external gearing, which ran a cam connected to the small lego pump. This then fed into the pneumatics system. There was also a pressure regulator, to stop pipes blowing off and to stop the pump from pumping too high and burning out the Naro's motor. This was made with a small lego cylinder held back by adjustable strength elastic bands. When the pressure reached a certain level, the cylinder was able to extend against the force of the elastic bands, and press a switch, which cut the power to the motor. Once the flipper had been fired (and some pressure had been let out of the system) the elastic bands would retract the cylinder again, and the pump would continue pumping. The system, in practice, was quite impressive, in combat however, it was not as realiable. While I did have some quite large flips, the large majority of them were no better than what you can achieve with a good servo flipper, and some of them were just plain awful. I also really disliked having to wait between flips to give the system time to re-pressurise, and also having to be careful when I flipped, as to make sure I didn't waste one. I also found this version slightly slower than I would've liked, and also still very jittery and hard to control, because of the S136l boards, which I will be replacing in the next version. The front design also proved itself to be not as good as the big, old, flat flipper I used to have, so I will be switching back to that aswell. Overall, this version of Void did quite well, and it managed to win the combat and football at RRC7, however, this was mostly down to a solid bot, and I would say I would've done the same, even without the flipper, as it was not very spectacular. I did however learn how to make the chassis a different way, to make it a lot lighter and stronger, and I also got the want to play around with pneumatics out of my system. However, I decided they were too unreliable and too much hassle to have in what is my main robot, and so I will be switching back to a servo for my next version. This version was impressive because of the pneumatic system I managed to fit into it (first compressor in ant ant :p), however it had too many shortcomings. I've learnt a lot, and I think I'm now prepared to build the ultimate version of void (for the moment anyway :p).